Passenger may enjoy a combined fare on two trips at $6.2 when interchange from this trip (Aberdeen Centre bound) to HKI GMB route 58 (Kennedy Town Station bound) or 58A (Kennedy Town bound) by using the same Octopus within 60 min. Passenger may enjoy a combined fare on two trips at $4.4 when interchange from this trip (Aberdeen Centre bound) to HKI GMB route 59A or 59B (from Aberdeen Centre) by using the same Octopus within 60 min. 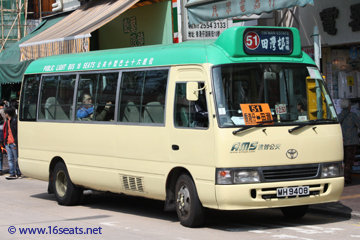 Passenger may enjoy $1.0 fare discount on HKI GMB route 4B, 4C, 4S (Shek Pai Wan bound), 39C, 63A (from Aberdeen Centre), 52 (Stanley Prison bound), 63 (Queen Mary Hospital bound) or 69 (Quarry Bay bound) when interchange from this trip (Aberdeen Centre bound) by using the same Octopus within 90 min. Passenger may enjoy $1.0 fare discount on this trip (Tin Wan Est bound) when interchange from HKI GMB route 4B, 4C, 5 or 35M (Aberdeen Centre bound) by using the same Octopus within 60 min. Passenger may enjoy a combined fare on two trips at $6.5 when interchange from HKI GMB route 58 or 58A (Aberdeen Centre bound) to this trip (Tin Wan Est bound) by using the same Octopus within 60 min. Passenger may enjoy a combined fare on two trips at $4.4 when interchange from HKI GMB route 59A or 59B (Aberdeen Centre bound) to this trip (Tin Wan Est bound) by using the same Octopus within 60 min. Passenger may enjoy $1.0 fare discount on this trip (Tin Wan Est bound) when interchange from HKI GMB route 4A, 4B, 4C, 4S (from Shek Pai Wan to Aberdeen Centre), 39C, 63A (Aberdeen Centre bound), 52 (Shek Pai Wan bound), 63 (South Horizon bound) or 69 (Cyberport bound) by using the same Octopus within 90 min.